My backyard is my stress buster. Spending some quality time and enjoying the beautiful nature around me helps me feel fresh and motivated. The greenery and fresh air can be so relaxing. And trust me, I don’t have a big backyard. But I am glad, you know why? Because it is so easy to maintain and also budget friendly. I know not all are lucky enough to have a big front or backyard or have a nice swimming pool or a huge garden. But even a small backyard can do wonders. You just need to design it properly and you can easily have an enjoyable space for you and your family. So, if you are looking forward to modifying your backyard into something beautiful, then let’s bring out the creativity within you. 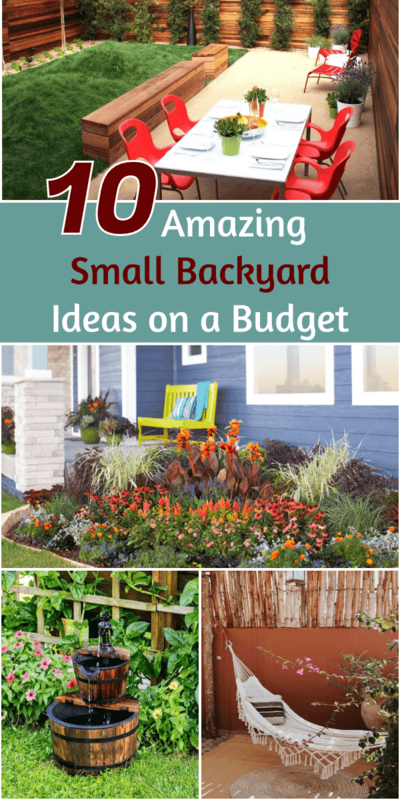 I have listed down 10 small backyard ideas that will help you transform your outdoor space into a functional and pleasing backyard. Let’s start with something simple yet functional. It is very natural for one to get excited about the backyard and over-do it. But this will only make it look cluttered. If you want your backyard to be elegant just plan properly. Even simple looks beautiful. If you have a green lawn, it’s perfect but if not add faux-grass to your backyard and throw in some chairs or a couch. Add some potted plants around it to make it look more refreshing. Put a table along with the chairs, so that you can keep your books, mugs, and other stuff there. A pathway can be a great way to add a focal point to your garden. It also makes your small backyard look big. You can create a pathway using tiles or rocks and pebbles. If you want to keep it simple then just use the ground and give a border to your path with potted plants and rocks. A pathway can also help you divide your backyard into spaces which can be used for different purpose. Corners of the house are often ignored and left plain and boring. You can decorate the corner near the back porch with colorful plants. Flowering plants will give an extra glam to the corner. Make a patter of colors or just mix them to have each color pop out. If you keep a bench on your porch near this corner, you can spend time reading the book or just meditate with the beautiful nature around you. Turn your simple backyard into a magical space by adding lights to it. Add string lights in the outdoor sitting to make it into a beautiful romantic space. You can even roll the string lights around the trees and fence and they will give you a festive feeling throughout the year. 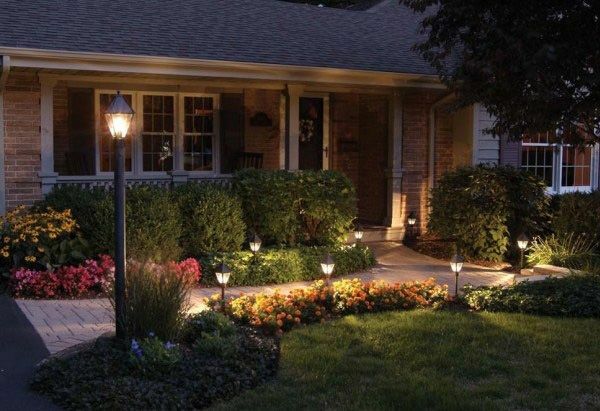 Lights can also be used on the borders of the pathway or sidewalks. It will give a more appealing look to your backyard. 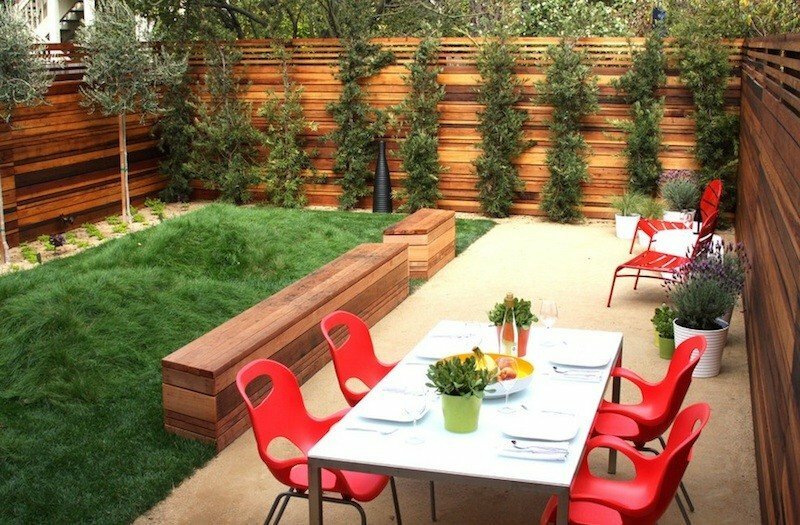 It is one of the best small backyard ideas. As hangings take no ground space, that means more space for your backyard decoration. 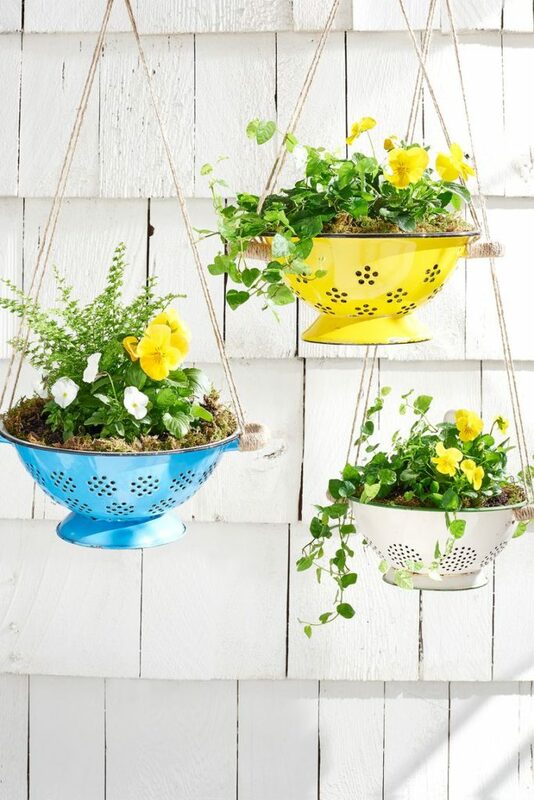 You can use holders and colorful baskets to plant the flowering plants and hang it on the wall or porch. If you have a fence around your house, make the most of it by hanging these pots. You can even use coffee or soup cans for planting. 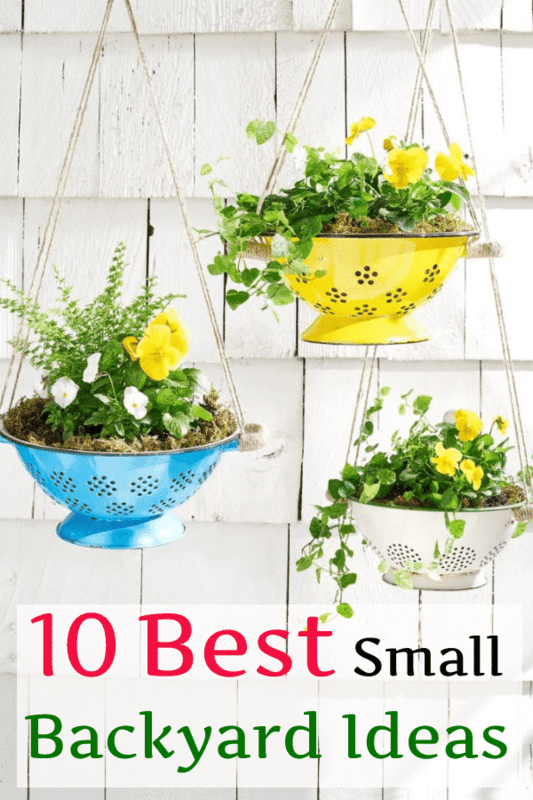 So basically, these hanging pots can be used to transform any boring space into a colorful and attractive space. One of the best ways to utilize and maximize the small space is by using tiered planters. They provide with ample amount of vertical space on a small ground. Tiered planting makes your backyard appear bigger. You can use crates or boxes stacked upon each other for tiered planting. This adds an attractive feature to your yard and also none of your plants will go invisible. 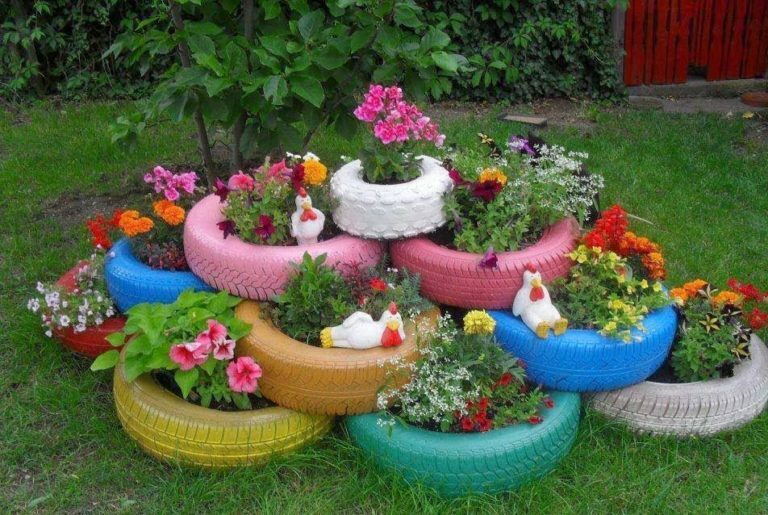 If you want to be more creative, paint tires in different colors and stack them for planting. Who doesn’t enjoy the sound of water falling on the rocks? 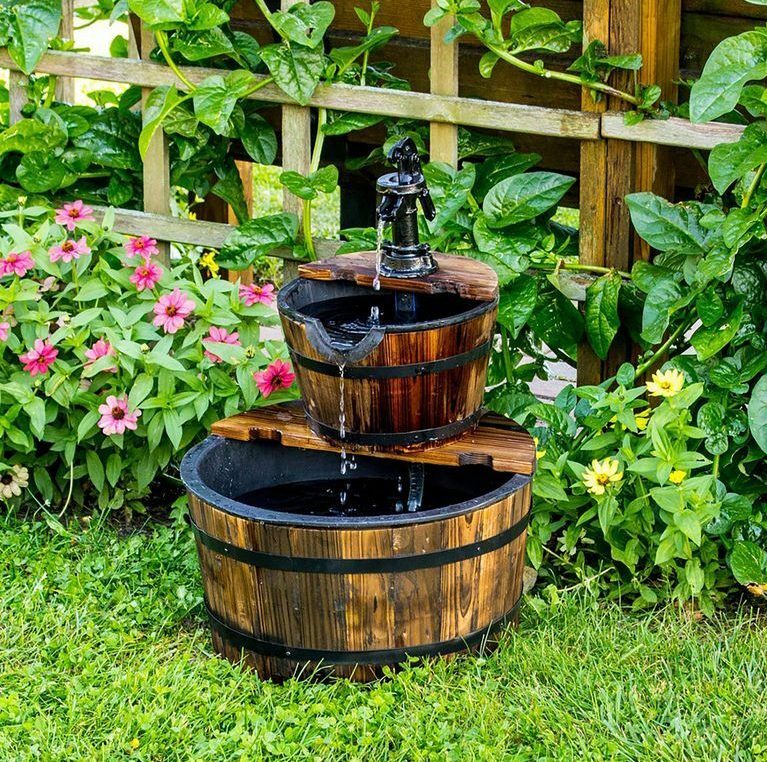 If you want to make your backyard more appealing and wish to get closer to nature, add a water feature to your backyard. The water feature can be in the form of a small DIY fountain, a waterfall or a rocky pond. They are not that difficult and costly to implement, you just need a few cheap items like water pump, old barrels, and stone/pebbles. Make your simple backyard into a multi-purpose backyard. Add a sitting area or a dining table in your yard to make a comfy place for a family get-together. You can even add a swing chair or a fire pit to give a unique touch to your yard. Make your backyard a spot for relaxation. Use a bold color scheme for your backyard furniture, this will easily grab anyone’s attention. 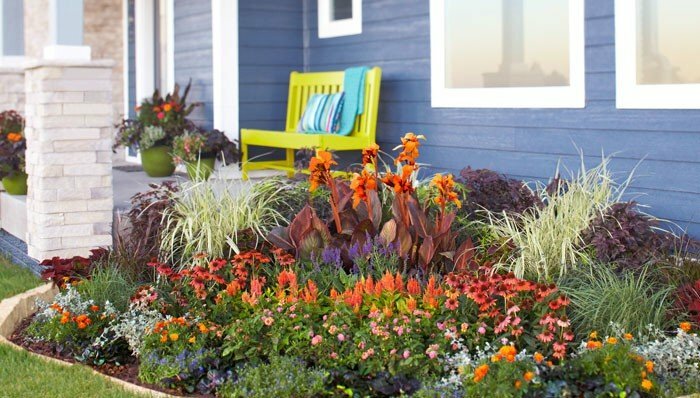 Add a few flowering plants to complete your backyard design. Try something different with your yard. Instead of using traditional furniture try using a hammock. This can be an interesting element in your backyard. You can put on a hammock between the two trees and enjoy the beautiful nature and fresh air. 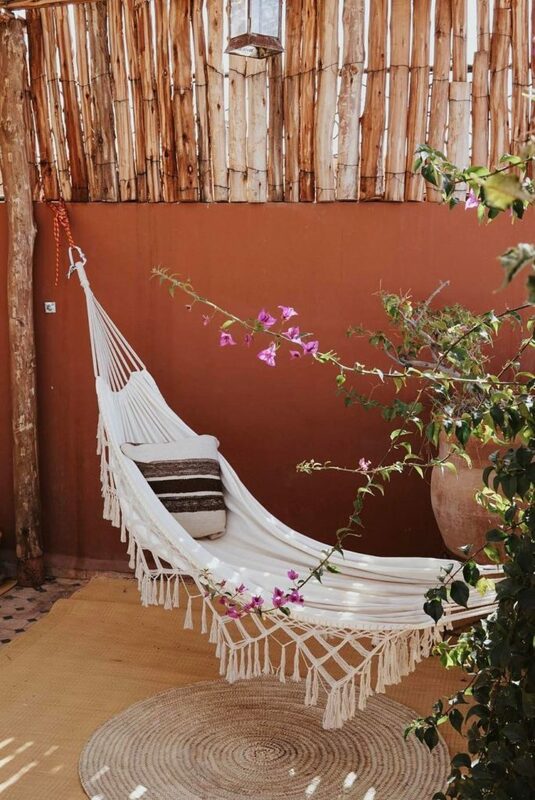 Add a rug or pillow to your hammock to make it cozier. If you don’t have trees, use the architectural elements like a fence and wall to put on a hammock. 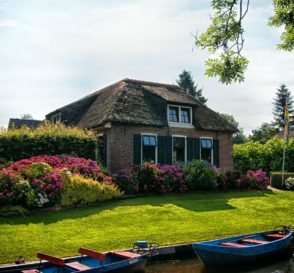 If you are in a place where the climatic conditions won’t allow plants to grow, that does not mean your backyard cannot be decorated or turned into a useful place. 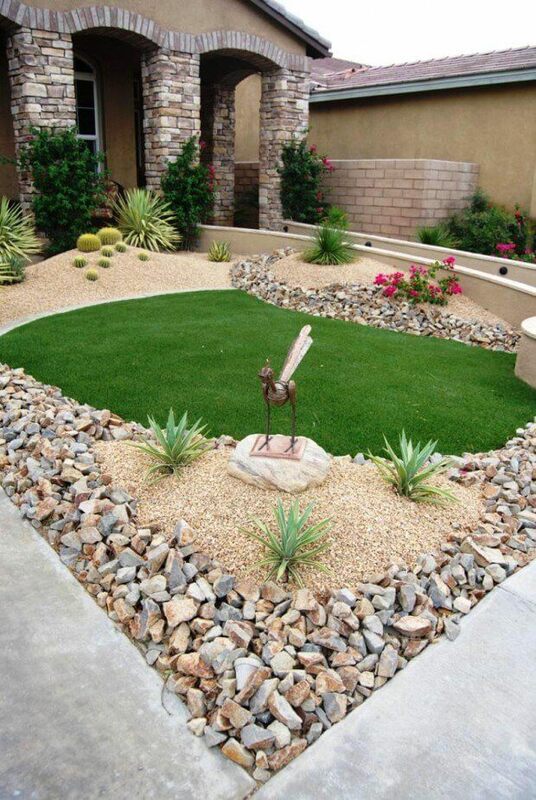 It’s not necessary to have green grass and flowering plant to make your backyard appealing. 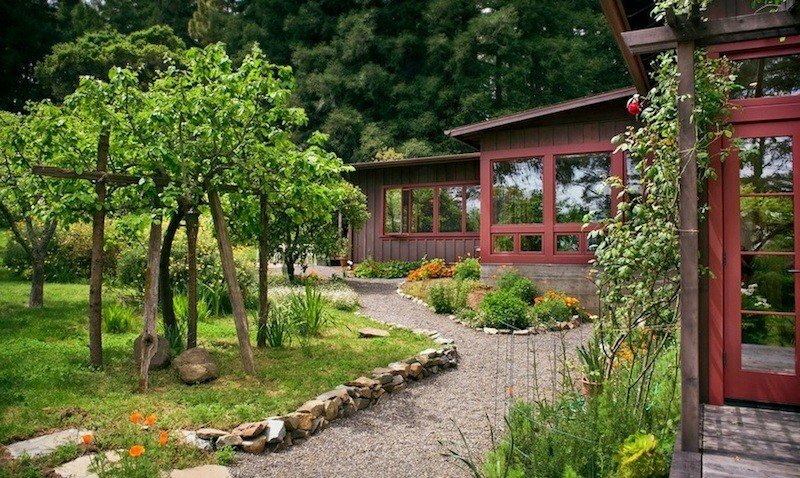 Design your yard with rocks, gravel, and pebbles. They are easy to maintain and make your yard sophisticated. You can grow succulents, and make designs using colorful stones. Add a fire pit, some lights and chairs to make it multi-purpose. I hope you found my post helpful. 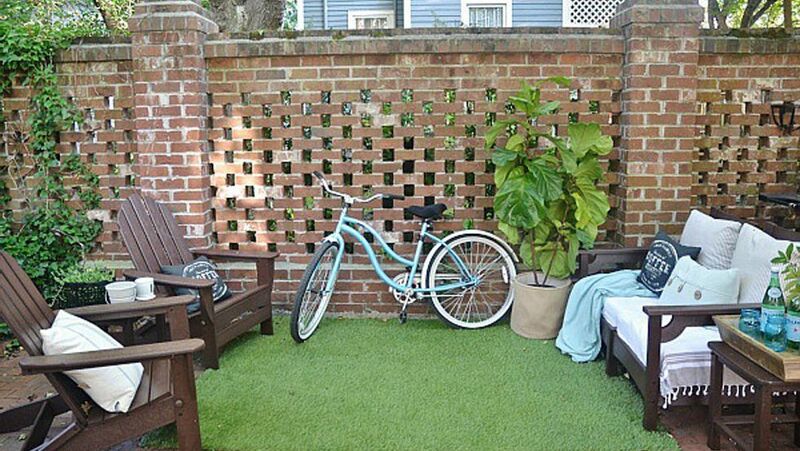 You can now rock your backyard with these small backyard ideas. 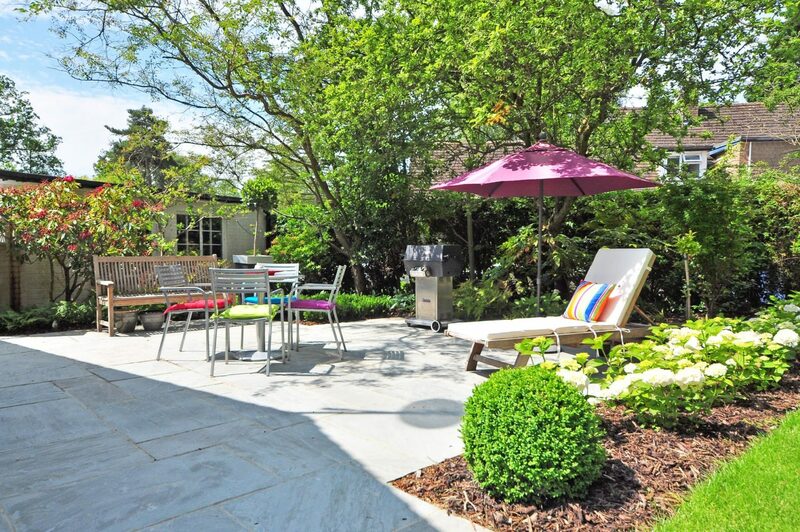 Just remember to design your backyard in a way that you will love and enjoy.